I posted my 39 weeks blog post two days ago, which was actually 2 days early. I ended up going into labor that night! We went to bed as usual. I woke up around 10:30pm because I was super hot and wanted to turn on the ceiling fan. And, boom, my water broke! That’s the same way it happened with Turner. But this time around, I was Strep-B positive (a bacteria that lives in the body that can be passed to baby) so I was told I would have to come in to get an antibiotic if my water broke first. Sure enough, I called the birth center and they said to come on in. I called my mom to come stay at our house with Turner and we hit the road! Once we got there, they hooked me up to a monitor to listen to Gracie moving around and see how often my contractions were coming. They were about 10 minutes apart already. So they gave me a dose of antibiotics and told us we could get some sleep for a few hours. Stew slept for a few hours while I just rested. I probably fell asleep for about an hour. Since I was laying down, my contractions started to slow down. So I got up around 3:30am to walk around and try to bring them on. Stew woke up around 4:30am and helped me move around so we could pick up the pace. I walked around, rocked on the birthing ball, and took a shower (all the while listening to my hypnobabies tracks). By around 7am my contractions were between 3 and 5 minutes apart but not coming at a consistent pace. Again, since I was StrepB Positive, I had to have her within 12 hours since my water broke first. So it was game on. My midwife, Erin, gave me some crazy herbal concoction that I had to drink every 15 minutes for an hour. Once I choked those down, my contractions were coming much more quickly! By 9am they were pretty close and strong. So I got in the birth tub and it was time to push! There was a little hiccup at that point. The urge to push disappeared and my contractions started slowing down! 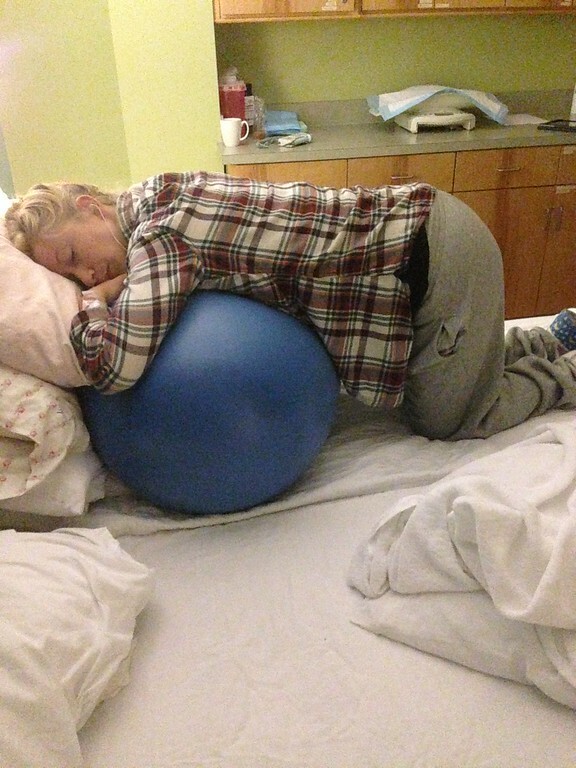 My midwife made some adjustments in my positioning and I was ready to push again. A few minutes later and Gracie was out! 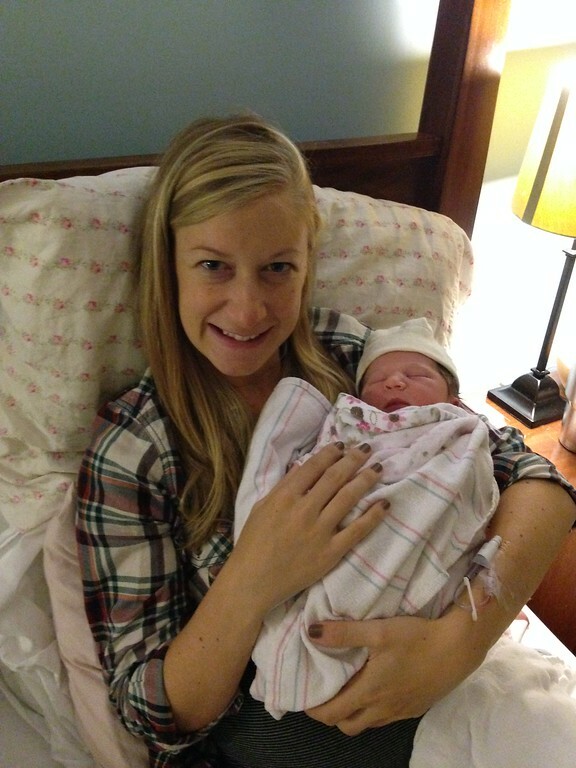 She was completely wrapped in her umbilical cord. She cried immediately and then stopped crying. I was so nervous! Erin quickly unwrapped her and she was good to go! Scariest minutes of our lives! 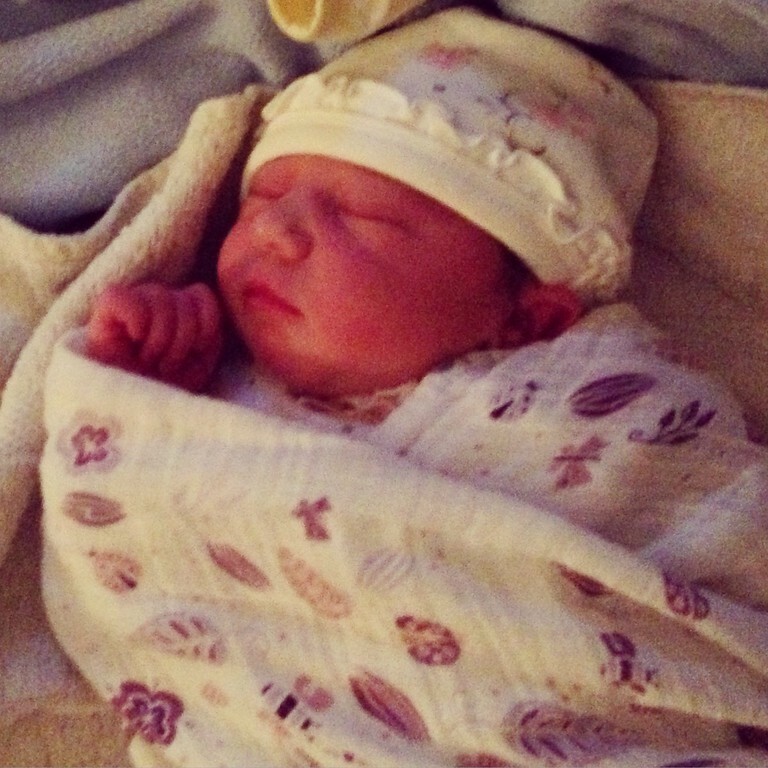 Gracie Jane Watson was born at 10:04am on September 24th. She weighs 7lbs 2 oz and is 20 inches long. She’s the most perfect little bundle. All of our prayers have been answered with her! Wish us luck in our transition to a family of four! I can’t wait to share updates! I read this amazing article ,written by Sarah Clark, this morning about having a natural birth. A lot of it seems obvious, but it really makes sense. I should print this out and read it as a reminder when my due date gets closer! This is just so STINKING true. You have to believe that you can do this. Your partner has to believe that you can do this. Birth is normal. It is also JOYOUS. Find the joy and the magic in it- don’t just think about how hard or how painful it will be. I can guarantee that if you think it will be a negative experience it will probably end up that way. Birth isn’t always easy or pain free- but it is always an amazing, transformative, life changing event that should be cherished. Ahh….this can be a tough one to swallow but it is so very true that we need to own our birth choices. I think that this is where the true empowerment comes for women at the time of birth. In fact, talking to women what makes them feel awful about their birth is not where it took place or even everything that happened but if they were the one MAKING CHOICES. It is a big responsibility to own your birth and your birth choices- but it is so very worth it because herein lies the power inherent in women. If you think breastfeeding is great and will give it a try but you don’t know anything about WHY you should or the benefits to you and the baby, it sure is a lot harder to stick with it when the going gets tough. The same is true with birth. Accomplishing a natural birth is going to be easier for those motivated by KNOWLEDGE of why they want to do this and HOW they can do it. That is why I am so devoted to the teaching of natural birth classes– education makes all the difference in outcome. Ummm…..YES A MILLION TIMES OVER! Every time I go on about the midwifery model of care I hear from people about their AB FAB OB. 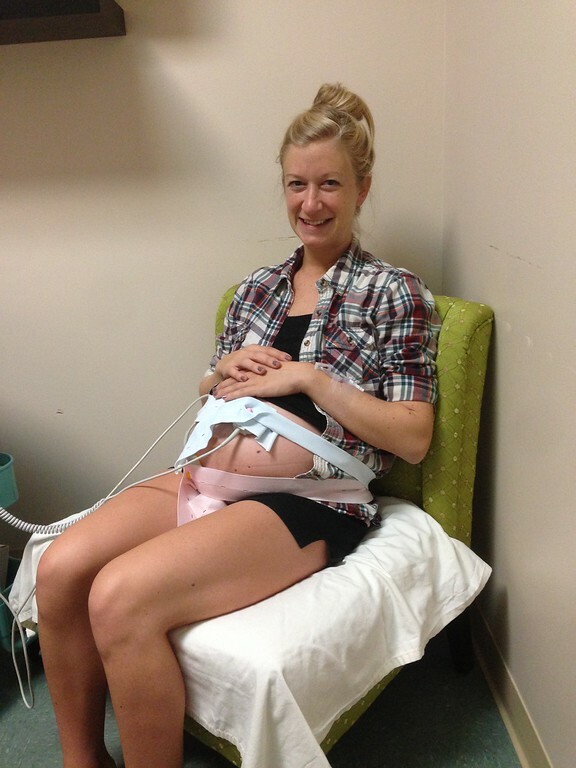 Sure, there are great OB’s who trust birth and all that jazz. But let’s be real- they are trained surgeons. They have a place in birth- but probably not as much of a place as we give them sticking their noses in every single healthy birth out there. Choose midwifery (carefully- they are not all created equally) and you up you chance of a natural birth. Holy cow, this is a biggie. In labor you desperately need the people around you to support your wishes if you are too busy laboring to actually VOCALIZE your desires! Too many women plan on birthing with people they DON’T TRUST, DON’T LIKE, AND DON’T FEEL COMFORTABLE AROUND!!!! That is, simply put, a mistake. Man, this is so true but so hard to say sometimes. I think we want to be flexible and open to change- you kind of have to be because birth is unpredictable. BUT- you also need to be committed. Committed to going natural, committed to staying low risk so you CAN go natural, and just committed to the long haul (birth isn’t always a cake walk). How is this really going to play out? Maybe he takes you to a rowdy party. You drink a little. You go park somewhere. You get the picture. Having a “I am gonna try a natural birth” attitude with a cut happy OB and no knowledge of birth and an openness to the epidural, is like getting drunk with the hot guy in the back of his car when you have raging teenage hormones and expecting to stay fully clothed. It might not turn out how you planned. I highly suggest researching the drugs commonly used for pain in labor and learning about their side effects. This is eye opening to say the least. I know this sounds a little contradictory, especially after my “keep your pants zipped” high school analogy. Let me explain. YES- we need to be stubborn and strong and even flexible. Birth can change and it is not often that every little thing goes just as we had in our head. When we talk about surrender in birth, we mean surrendering to the process, to your bodies natural instincts, to the moment, and to the power of BIRTH. So many women are afraid of losing control that they hold in, tense up, and don’t just open up and LET GO. Surrender is a deeply important part of labor. And…surrender is pretty handy when it comes to motherhood too. Birth is the greatest teacher, isn’t it?